This is easy to make but impressive to serve, with the white panna cotta drizzled with bright red syrup and tiny pomegranate seeds. The syrup is very sweet, so don’t add too much sugar to the pannacotta. Separate the gelatine leaves and place in cold water to soak for 5 minutes. Meanwhile, in a pan over a low heat, warm the milk, yoghurt, cream, orange zest and sugar, stirring constantly. Don’t allow to boil. Once hot, remove from the heat. Squeeze out excess liquid from the soaked gelatine, add it to the pan and stir to dissolve. Once fully dissolved, pour into 6–8 jelly moulds, ramekins or even cocktail glasses. Cover with plastic wrap and place in the fridge to set for at least 5 hours and preferably overnight. Well in advance of serving, make the syrup: if you pour hot syrup over the panna cottas, they will melt, so you need to leave time for the syrup to cool. 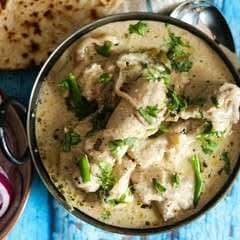 Place all the ingredients except the pomegranate seeds into a non-reactive (non-aluminium) pan and bring to the boil. Simmer until reduced by half to three-quarters and thick enough to just coat the back of a spoon. (It will foam up, so keep an eye on it to avoid it boiling over.) Cool and strain out the zest . To un-mould the puddings, pour 3 cm (1 ¼in) of hot water into a wide shallow bowl. Dip the panna cotta moulds briefly into the water for no longer than 5 seconds, being careful not to get water on the puddings themselves. 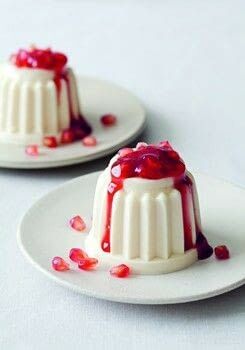 Turn out on to serving plates, drizzle with a spoonful of the cooled syrup and scatter with pomegranate seeds.